The modern day characters used to write Kozu’ differ from both those of ancient times and from the characters used in the Kunibiki (Land-pulling) legend. Most probably the latter two are for phonetic purposes only and the one used today is the closest to the original word meaning. Today the character for ‘small’ is used but rather than referring to size, it’s likely that its alternative use is to express something ‘beloved’. 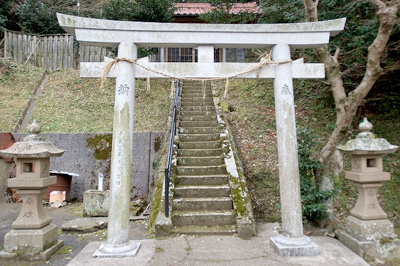 The ‘Salt Gongen’ is enshrined in Ebisu-jinja on the South side of Kozu village. The Salt Gongen is an ancient burial tomb. It’s a box-shape stone/slate combined coffin. The stone is sandstone and the base of the coffin is covered with round stones. It’s known affectionately by the locals as ‘O-Imi-Sama’ (The Loathsome One). On the death of a family member, after observing the traditional mourning rites on the 49th day, the next morning to ‘end the mourning’ all family members of the deceased’s bloodline gather at the nearest beach. This is said to be done early morning before daybreak in order not to meet anyone along the way. At the beach, seaweed is collected and offered to the Salt Gongen and straightaway one must worship at their patron god’s shrine. It’s then said that there is a ceremony of all the family gathering for breakfast in the deceased’s family chapel to ‘end the mourning’. 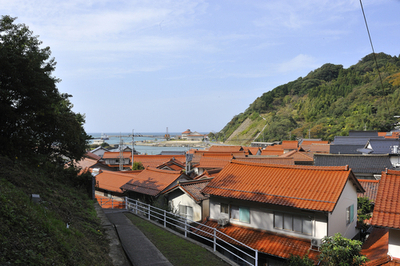 The End of Mourning sea water collection is of course done in a bamboo cylinder, however, rather than offering it at the local shrine, it is taken to Ichibata Temple instead. This is one example of the type of worship done in this area. The Kozu seashore is the beginning of an impressive sheer rocky cliff bettered only by that of Koizu. This cliff gives the impression that it is constantly falling into the sea, making it a very valuable geological phenomenon. It’d be well worth seeing it from the viewpoint of a boat out at sea.